Circolo light grey mirror radiator 1800mm high x 480mm wide. Fancy and unusual, this tubular column mirrored radiator has a full height mirror incorporated into the design. This designer radiator is a modern design with a heat output of more than 3000 btu. Ideal for living rooms, bedrooms and hallways. Circolo mirror is a modern radiator range which can be can be wall mounted in vertical or horizontal orientation. Available for sale here as a central heating radiator range, Circolo is a high heat output range with chunky tubular columns. With great coloured options as well, this range is a classic design choice for large rooms. Circolo is a Geyser exclusive design and therefore you are buying direct from the distributors online store guaranteeing you a direct sale at the lowest price in the UK. Mirror Circolo is available in 8 stock colours and many more special order bespoke colours to suit your trendy taste. Use the filters on the left-hand side of this page to view the coloured options listed below. The full height mirrored glass incorporated into this radiator is 270mm wide. The overall width of the radiator varies by model. Circolo mirror is unique in the fact that it has underside and side connection points for your radiator valves. This allows you great retro fit flexibility when it comes to installation because the Circolo mirror has two sets of pipe centres that you can choose from. 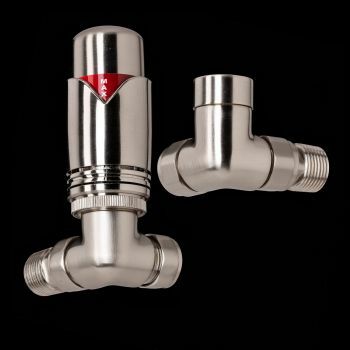 In general, connecting your radiator valves to the underside connection points gives you the neatest finish. This is because the radiator valves are more or less out of view underneath the radiator. 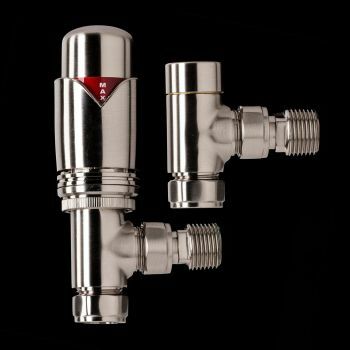 Also, it is a space saving option because the radiator valves do not add additional width to the radiator. 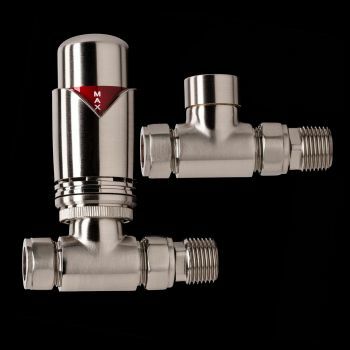 See the accessories category to see our range of radiator valves. Blank plugs are supplied as standard in the Circolo range to seal off the unused connection points. Another important feature is the 40mm diameter chunky tubular columns which hold a high water volume. Therefore, this radiator & mirror combination is quite a good source of heat output also. The range has high heat outputs starting at 3000 BTU through 5000 BTU and peaking at 7000 BTU. 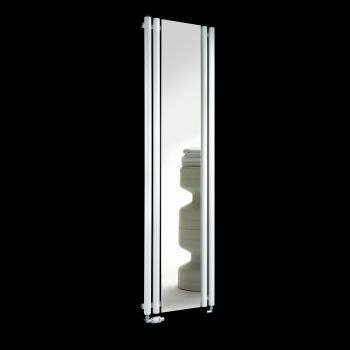 Circolo mirror are only available as vertical upright models. Circolo mirror is also available in a non-mirrored radiator only range also. Use the filters on the left-hand side of this page to view the whole Circolo range. For the bathroom we have the matching Cirtowelo bathroom towel rails in the heated towel rails category. Please do not compare this range with cheap, lower quality, lesser specification models sold elsewhere at places like B&Q, Wickes and Screwfix. We cannot be beaten on QUALITY for the PRICE. We do not engage in fake discounts or over inflated R.R.P prices. Instead we focus on design, quality and superior manufacturing. For instance, the vertical tubular columns on this Circolo range are 40mm in diameter each. Most radiators in this style have 32mm diameter columns or less which severely restricts heat output. Therefore, radiators which at first glance look like Circolo mirror, can in fact, be quite different. Once installed in your room, you would experience a striking difference in heat output between Circolo mirror and competing, visually similar radiators.